Tesla achieved an 80% market share of battery electric vehicles U.S sales in the last year. In 2019, Tesla is expecting to increase sales by 50%. Tesla has opened 27 new store and service locations, bringing out the total locations worldwide to 378 and mobile service fleet to 411 vehicles. Gigafactory 3 in Shanghai is expected to produce 10,000 vehicles a week by the end of the year. The all new Model Y will probably see higher volume than Model 3. Projections from Morgan Stanley indicate that EV sales will surpass traditional vehicle sales by 2038, and the global fleet of EVs will number one billion by 2047. The current global adaptation of EV is nearly 2%. Once the mainstream adaptation happens, growth will be at exponential rate (see the figure below). All major automakers are now preparing to phase out cars powered solely by internal combustion engines (ICEs) as Governments across the world are looking ways to tackle fuel emissions. The growth in electric vehicles and hybrid electric vehicles (HEVs) is climbing and by 2025, EVs and HEVs will account for an estimated 30% of all vehicle sales. According to J.P. Morgan estimates, adaptation of electric vehicles will rise close to 8.4 million vehicles or a 7.7% market share by 2025. While this jump is significant, it doesn’t compare to the kind of growth expected in HEVs - cars that combine a fuel engine with electric elements. HEVs sector is forecast to swell from the current 3% of global market share to more than 25 million vehicles or 23% of global sales by 2025. 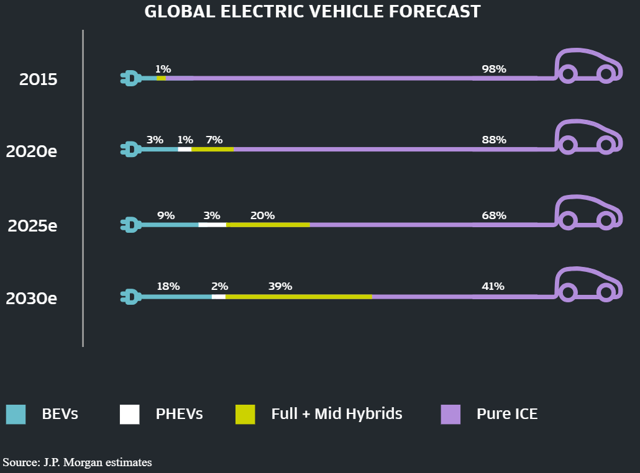 This leaves pure-ICE vehicles with around 70% of the market share in 2025, and nearly 40% by 2030. China to lead the transformation - According to J.P. Morgan’s Research team forecasts, the compound annual growth rate (CAGR) of China’s new electric vehicle market (EVs and Plugin Hybrid EVs) is set to hit 46% by 2020, with 2.5 million units produced that year - 25% above the government's target of 2 million units. Norway started its initiatives to promote zero emission vehicles from early 1990s. The Norwegian Parliament decided on a national goal that all new cars sold by 2025 should be zero emission (electric or hydrogen). In 2012, Norway registered 3% of EVs sales. This shows that it took almost 25 years to reach 3% or first 10,000 cars. But in the last 6 years, the growth has been exponential. By the end of 2018 there are 2,00,000 registered battery electric cars (BEVs) in Norway. Battery electric and plug-in hybrid vehicles together hold a 50 % market share in latest sales figures. Above story shows how Government policies can make huge impact on the growth potential of electric vehicles across the world. 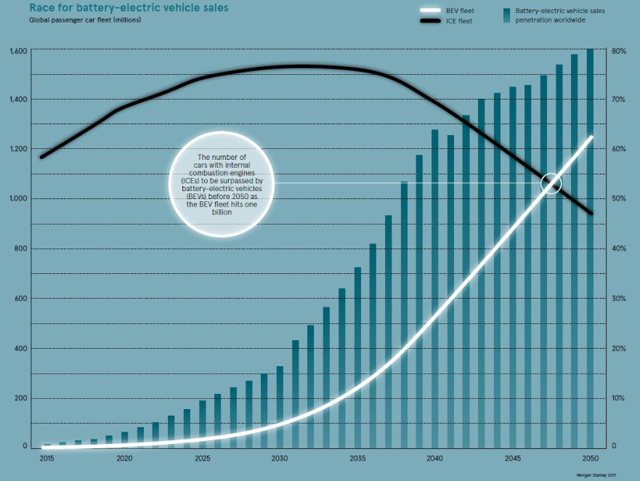 Since many more countries including China and India are leaning towards an EVs friendly policies, we could see a similar exponential growth rate during 2020 to 2025 period. Model Y - What Is Interesting? On March 15 2019, Model Y stepped into the limelight at an event at Tesla’s Hawthorne Design Studio in Southern California. This new fully electric compact utility vehicle (CUV) model was built on top of Tesla’s Model 3 platform and it shares nearly 75% of its parts. This seems to be big advantage to Tesla as it is able to streamline parts sourcing and much of Tesla’s internal manufacturing process for the two vehicles. If we compare Model Y with its competitors like Porsche Cayenne Turbo Coupe or Mercedes GLC AMG GLC63 S, there are many factors to prove that Model Y will be the most popular car from Tesla till date. Price point, safety, performance are well managed by Tesla to make this model a grand success. Below are some of the interesting features that makes Model Y unique. Tesla Model Y Performance ($60,000) will make the 0–60 mph sprint in 3.5 seconds while the fastest Porsche Cayenne Turbo Coupe will get the job done in 3.7 seconds ($130,000). Tesla also has a much lower center of gravity than Porsche Cayenne Turbo Coupe or Mercedes GLC AMG GLC63 S..
Energy consumption - Model Y is going to cost you $605 per 15,000 miles, whereas the Mercedes will cost you $2,550 and the Porsche $2,700. Tesla will have much better residual value at every stage of its life because Tesla’s powertrain has an 8-year warranty, whereas the fossils competitors only have 4 years. Entry Price seems to be a massive game changer as Tesla is planning to enter huge markets like India. Safety - According to Tesla website, Model Y is designed to be the safest mid-size SUV. Built from the ground up as an electric vehicle, the low center of gravity, rigid body structure and large crumple zones should provide unparalleled protection for Model Y passengers. In general, Tesla has estimated that its vehicles are 4 times safer than the average vehicle in the United States and 7 times safer than average when the Enhanced Autopilot solution is engaged. 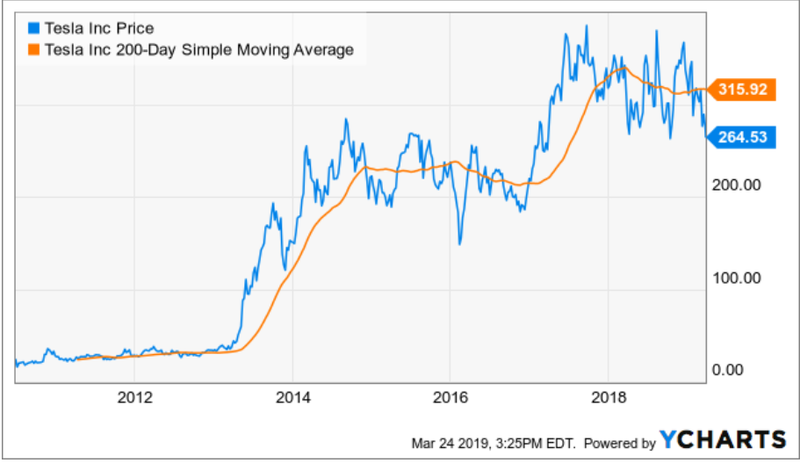 After a 3 year old consolidation Tesla had broken out its $180 - $260 range in February 2017. After that it has been trading in a range of $260 to $380. Now the stock is trading at the lower bottom of this range. Stock is almost near a triple bottom and I do not see a reason for its to fall back below $250. If it happens, it would be a great opportunity to get it for long term gains. I am pretty confident that it can break the upper range of $380 in next two to three years which would nicely give a minimum returns of 30% CAGR approximately. SUV market offers significant growth opportunities for Tesla and the starting price of $39,000 for the standard model of Model Y makes it attractively affordable in the crowded SUV market. These price points could be a game changer for Tesla. In the next three to four years, Model Y could account for up to 25% of Tesla’s total sales and could ultimately boost the company’s top-line and bottom-line considerably.